In this study, we report here a general protocol for making core-shell magnetic Fe3O4/SiO2-MPS/MIPs (MPS = 3-(methacryloxyl) propyl trimethoxysilane, MIPs = molecularly imprinted polymers, Fe3O4/SiO2-MPS as core, MIPs as shell) via a surface molecular imprinting technique for optical detection of trace λ-cyhalothrin. The fluorescent molecularly imprinted polymer shell was first prepared by copolymerization of acrylamide with a small quantity of allyl fluorescein in the presence of λ-cyhalothrin to form recognition sites without doping. The magnetic Fe3O4/SiO2-MPS/MIPs exhibited paramagnetism, high fluorescence intensity, and highly selective recognition. Using fluorescence quenching as a detecting tool, Fe3O4/SiO2-MPS/MIPs were successfully applied to selectively and sensitively detect λ-cyhalothrin, and a linear relationship could be obtained covering a wide concentration range of 0–50 nM with a correlation coefficient of 0.9962 described by the Stern-Volmer equation. 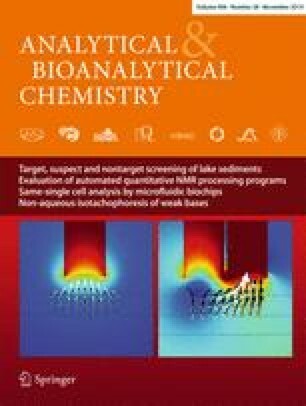 The experimental results of practical detection revealed that magnetic Fe3O4/SiO2-MPS/MIPs as an attractive recognition element was satisfactory for determination of trace λ-cyhalothrin in honey samples. This study, therefore, demonstrated the potential of MIPs for detection of λ-cyhalothrin in food. The online version of this article (doi: 10.1007/s00216-014-8126-8) contains supplementary material, which is available to authorized users. This work was financially supported by the National Natural Science Foundation of China (No. 21107037, No. 21176107, and No. 21277063), Natural Science Foundation of Jiangsu Province (No. BK2011461 and No. BK2011514), National Postdoctoral Science Foundation (No. 2013 M530240), Postdoctoral Science Foundation funded Project of Jiangsu Province (No. 1202002B) and Programs of Senior Talent Foundation of Jiangsu University (No. 12JDG090), Ph.D. Innovation Programs Foundation of Jiangsu Province (No. CXZZ13_0681).